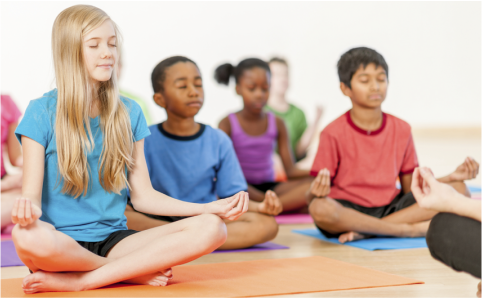 NamasYAY Kids Yoga is a kinesthetic learning experience focused on developing self- awareness, cultivating mindfulness, building confidence, and increasing strength and flexibility. I truly enjoy working with kids ages 3+ as a Certified Kids Yoga Teacher. My training has equipped me to work with all children - especially those who have survived trauma, have special needs, and/or hyper activity. I love using Yoga as tool to help children get connected to & acquainted with themselves. Yoga MUST be fun, accessible & relatable at any age. Children will play Yoga Games, sing Yoga Songs & Chants to supplement their physical practice. Children will learn pose sequences designed to meet their needs and will be encouraged to bring the learning home to share with parents & siblings. I believe in the power of patience and compassion when it comes to teaching children. I have taught children in variety of settings such as: Schools, Libraries, Pre-Schools, Yoga Studios, and even out in nature. Yoga can also be a powerful point of connection for families. Moving and breathing together outside of the structure of familial roles and responsibilities can be liberating for children & parents. Family yoga offers a unique opportunity for parents and children to relate to one another in a new way, create new memories, and explore mindfulness together. Bring NamasYAY to your child's school! physical activity all while having FUN! ***Parents Please take a moment to read the Registration Release above. read, reviewed, and agreed to the terms of the Registration Release.